Last week I was in Connecticut doing a psuedo VBS for children of church planters in the New England area. We kept the kids while the parents were in sessions. It was craziness trying to care for 24 preschoolers ranging from 10 months - 5 years in onw space. We had limited resources, and it was quite an adjustment from how we normally do things, but we learned a lot and it was a blessing to serve these families that really do serve in the trenches up there. enjoyed much cooler weather while Houston was hitting triple digits! got to cross Connecticut, Rhode Island & Georgia off my list of states visited! 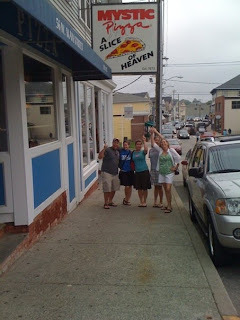 had a tourist day to Mystic, Connecticut - hometown of the movie Mystic Pizza, where we did enjoy a slice of heaven! 8:50am - finally on our plane, headed to Houston, no delays! All in all it was a great trip, a learning experience and a great opportunity to serve brothers & sisters in Christ! ...soooo much to catch you up on!!! wow, it's been over 2 weeks since I've blogged, and it's been a CRAZY 2 weeks! 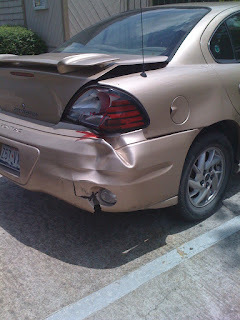 I can't believe I haven't updated since my wreck! Well, not to oversimplify, but VBS was great! Loved the "Jerusalem Marketplace" theme. Had wonderful workers, over 200 preschoolers & 350 grade school kids...that's a lot of children, and about the same amount of teachers & workers...yeah, that's a lot of people. I really do love the week of VBS. The 4 or 5 months leading up to it are a lot of work sprinkled with some stressful moments, but 35 kids making decisions to follow Jesus makes it all worth it! Having my nephew here for the week was super fun too! He loved EVERY part of it, especially being a part of the concert on Friday night. Monday - sunscreen exploded in one compartment of my backpack, leaking through my backpack and getting ALL over everything in that compartment :( thankfully a few guys helped me clean it up, but it took several days for it to really dry out and be somewhat normal again! The saddest part about this incident is that it ruined my camera and so I don't have ANY pictures from the week :( super sad, but I have been wanting a new camera anyways! Tuesday - Saints (Sponsors) vs. Sinners (Seniors), yes this is what we really call it, softball game. We dominated, I got a double (which is significant for me), final score 18-3! Tuesday night was something we call the Tribal Shout. Camp is broken up into the 12 tribes of Israel. I was the tribe of Issachar this year. This year for the Tribal Shout each tribe was given a prophet to portray and tell the story of. We were given Micah, and the kids did a great job coming up with a cute skit, getting us first place! Woohoo! Wednesday - This year the scripture focal passage for the week is from the time of Solomon's reign through the end of the Old Testament, yes, a huge chunk! Mainly focusing on the building of Solomon's Temple, the destruction of the Temple, the Exile and the word from the prophets. So on Wednesday we experienced a pseudo exile. The kids (and many of the sponsors) were not aware this was going to happen. We were sent out from camp on a hike, not completely sure of what was going on. We had no lunch, just bread, honey, almonds & dried fruit (something along the lines of what the people in the Bible might have had). We were to eat and share as we were trekking. Finally we stopped, after about 1.5 miles. Then we read scripture about the exile and the destruction of Jerusalem. The kids were ok with it, but of course when we got back some of them were a bit grumpy about the whole thing. The coolest part was that since we had essentially skipped a meal, it had saved about $500. The youth minister had the idea to send that money to a ministry in Africa that works with street children. That $500 was enough to buy a cow that this ministry could use to drink milk and sell the milk for prophet. Well, this ministry was very grateful, but had found out about another ministry of the same kind that seemed to be in more desperate need of the cow, so they gave the cow away...how selfless!!! Well, that inspired 2 high school girls. They thought if missing one meal could buy a cow, how much more could they do? So they announced that they were collecting more money to send to this ministry, hoping to get enough to buy another cow! Well less than 24 hours after starting collecting, they had received over $1,100!!! And they will probably get even more! How cool is that! Such and awesome learning experience, and even better that it was student led! Thursday - All week each tribe had been building a wall using whatever natural resources they could find to protect their camp site. My tribe, Issachar had been hauling and stacking huge rocks. They had built a trench for foundational support. We were able to build up a wall that was about 12 feet wide and 4 feet tall. Since we wanted more height, we propped large (8-10 ft)and pointy tree branches up against it. It really was a pretty good looking wall and I am super sad that I don't have any pictures of it! The kids were really excited when they announced that we had gotten 2nd place out of all 12 walls! Woohoo! There were a lot of other really neat and significant things that happened at camp, but a lot of it would take a lot of explanation. It was a great week. I think about 10 people were baptized and even more were saved that wanted to wait and be baptized at home with their parents! God is good and it is a joy to be a part of His work! The icing on the cake was when I got home and the buses were driving into the parking lot, I saw my boss, her husband and my summer intern standing in the parking lot. I looked at Rebecca and said, "What are Susan & Joe doing here?" before I could notice she was saying, "They are standing my YOUR NEW CAR!!!" What? "SHUT UP!!!" Sure enough, my dad had arranged for my car to be driven up to Houston and for my boss to go get it and deliver it to me so that I could drive home after camp in my new car!! How crazy exciting is that? They had made big posters that said "Kasey's New Car" (don't ask me how I had missed seeing those initially). All the kids on my bus were really excited and thought it was really cool that I had a new car waiting for me, so did I!!! I love my new car, she is beautiful! Sorry, no actual pics yet...I'm working on a name. Barbie was my initial thought, since it's a Malibu. I've also thought of Emmy (as in Emerald) or Jade since it's a unique shade of green. Thoughts? I'd love a vote on those 3 names, or other suggestions. 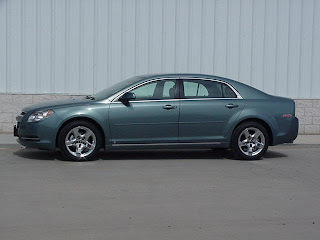 Here's a picture I got online, it's not my car, but it looks just like it, just to give you the idea, but the picture doesn't really do the color justice, I love the color, which is technically called Silver Moss, just in case that might inspire a name for her. Sorry for the marathon post! Thanks for hanging in there! I'm off to Connecticut on Tuesday, so don't expect another post for about another week. I promise to update on that trip as well! no, she did not herself stop, at all. yes, we exchanged phone numbers and said we would "be in touch"
yes, I was nervous to get the second estimate, what if it was half the price and then the lady refused to pay me the price my place had quoted? yes, I LOVE having my dad in the car industry, very handy!!! yes, this is a crazy chain of events, especially with all that I'm dealing with for VBS!